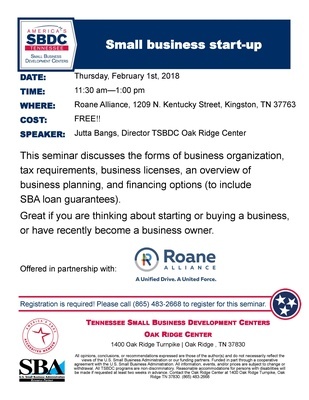 Small Business Start-up Seminar presented by TSBDC. This seminar discusses the forms of business organization, tax requirements, business licenses, an overview of business planning and financing options (to include SBA loan guarantees). Great if you are thinking about starting or buying a business or have recently become a business owner. Offered in partnership with The Roane Alliance. Registration is required! Lunch is not provided with this workshop. Please call 865-483-2668 to register for this seminar.